Joe Holt and Orange Gao attended the Digital Economy CDT Network (DEN) Writing Retreat. 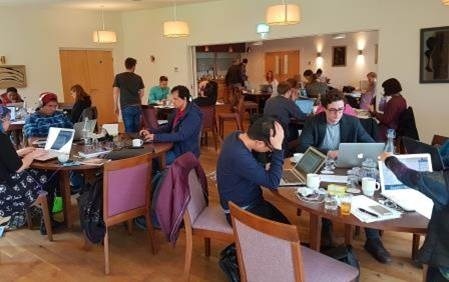 28 PhD students from across nine of the DEN CDTs attended the 2-day residential retreat, which took place on 21-22 March, including Cloud Computing, Digital Civics, Financial Computing, Healthcare Innovation, HighWire, Horizon, Media & Arts Technology and Web Science centres. The retreats, funded by the Network, provide the opportunity for CDT students to focus on a piece of research writing of their choice, where they can work individually in a series of time-focused sessions, whilst benefiting from being able to network and receive support from peers during the breaks and over dinner. Speaking about her motivation for attending Orange said "Most of time, we never get a chance to focus on writing in the office. Brilliant ideas and thoughts should be written down, but with always lots of things to do and we push writing to the lowest priority. This was a chance for us to concentrate 100% on writing." Orange concluded "It was a brilliant time to get to know myself. From this experience, I realise that I can be productive if I focus to do something. I understand more about saying “one weapon for beating procrastination is starting somewhere… anywhere”. I didn’t have a clear structure of how I should write before attending the retreat. The event is well organised and the facilitators are extremely helpful. They helped us to set the writing goals: long, medium and short-term. Once we started, everybody was focusing on their own work and I was enjoying the time with professional people. I was impressed by enthusiastic students and especially learning atmosphere. I couldn’t believe I could constantly working for 1 hour without being distracted by social media or being lazy!" IMAPS-UK’s MicroTech annual conference was held 16 March 2017 at Rutherford Appleton Laboratory (RAL), Didcot. 3 representatives from Loughborough University attended : Dr David Hutt , Dr Jacob Wang (poster presentation) and Cohort 3 researcher Youssef Hamid. The MicroTech event brought together several actors from the microelectronics supply chain in the UK dedicated to Micro-Assembly and related technologies. The conference featured Keynote speakers such as GraceO'Malley from “iNEMI – International Electronics Manufacturing Initiative” revolving around Future technology trends or Rob Harper from the esteemed “Fraunhofer IZM, Department of System Integration and Interconnection Technologies”, on "Panel Level Embedding for Power and Sensor Applications". Further technical presentations ("Alan Envas-Unisem", "Sebastien Holtkaemper-Hesse Mechatronics") & table top exhibits on the latest developments "Urs Berger- Optomec", technologies and capabilities, in addition to poster displays from UK research. When I started my PhD two and a half years ago, I would never even imagine that I would be writing those words from Ulsan in South Korea (at that time I did not even know such a place existed). Yet here I am on a three months research placement. 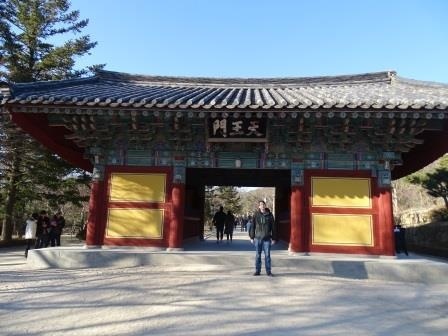 This post is a brief recollection of my experiences in South Korea so far. I arrived in Seoul early morning on a cold January day, and after short and uneventful journey I was sitting on a train going across South Korea to Ulsan. Through the window of a train I couldn’t help but notice how beautiful this country is. Wherever you look you can see hills covered in forests with cities blending between. I felt the beauty is under promoted by Korean modesty which is really a shame because the country is absolutely stunning. Nowadays whenever I travel around Korea I still cannot help myself but look around all the time to admire the views. University is also a nice place to be in. The place I am in is called Ulsan National Institute of Science and Technology or in short UNIST. The university is new as it was started only 8 years ago, and building I mostly work in was open no longer than half a year ago. University is located among the hills about 5 km away from closest town but it is well connected to train station and town by numerous buses. Working hours a lot different than in UK, usually students do not come until 10 or 11 am but they stay till very late. When I usually leave at about 9 or 10 pm there are still researchers in the lab. Another big positive aspect is food. In Korea often food is cooked by restaurant guests on the table in front of them (for example Korean barbecue). In restaurant we went, there was a big table (for about 10 people) and in the middle of the table three spaces for a real charcoal grill, which was brought to us by waitress for us to grill food on. The meat comes in small pieces and is eaten straight from barbecue with variety of sauces and vegetables (including famous Korean Kimchi). Of course there exists restaurants which serve food cooked in kitchen similar to European style restaurants. Also food variety is another point worth mentioning, I did not know you can have chicken in so many different ways before. 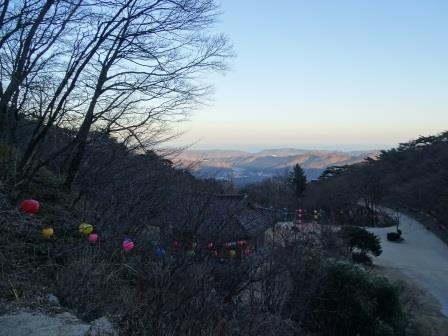 The last blog was mostly focused on Korean culture, food and landscape. In this part, I will focus on outlining the difference between universities in Korea and the UK. I will also talk a little bit about Ulsan National Institute of Science and Technology (UNIST) itself. There are a few key differences between universities In Korea and in the UK. First of all undergraduate students are expected to do internships in research groups in university. Generally, they are semester (or summer and winter break) lasting. The internships would be very similar to a final year project where the student is working on a small project. Another difference is freedom of choice of modules to study. In the UK, modules (lectures) are generally same for all students on given degree and module choice is limited to choosing one or two extra per semester. In Korea (or at least in most degrees and universities in Korea) about half of the modules is fixed, while students are free to choose the rest. The choice is very broad; to give an extreme example engineering students in UNIST can even pick up an instrument (Piano, violin etc.) learning module. From my brief encounters with students, it appears that such an approach results in very good independence, self-motivation and pro-activity. Finally, master’s and PhD degrees are similar to USA style where both consists of projects and lectures and lasts 2 years and 4 to 5 years respectively. In recent years Korea started to invest heavily in science and engineering and UNIST is a result of such an investment. 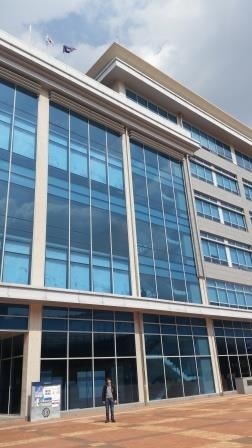 As I mentioned in previous post campus is very modern, and laboratories are well equipped. There is a significant amount of funding available for equipment if anything is necessary. In laboratories, equipment is state of the art (for example numerous motion capture systems or top of the range radio based positioning system). High-quality research orientation is also present in very simple and easy to use administrative support tools such as purchasing done with just a credit card. This approach resulted in many famous professors being attracted to UNIST such as Prof. Rodney S. Ruoff. With capable students and significant available funding, Korea offers a great working environment for academic researchers. This is supported by other positive aspects like good food and excellent landscapes. CDT-EI researchers have managed to secure funding from the Office for Low Emission Vehicles, the Department for Business, Energy and Industrial Strategy (BEIS), Innovate UK and Far UK Ltd to develop research that makes an impact on emissions savings from road vehicles. 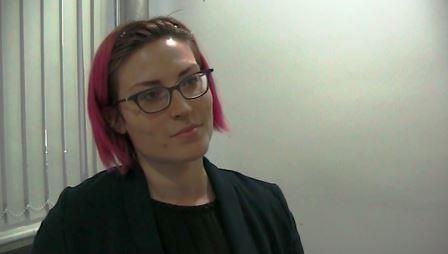 The Multifunctional Materials Manufacturing Lab at Wolfson School, led by Dr Carmen Torres-Sanchez, and her industrial collaborator (Far UK ltd) have been awarded more than £250k to develop excellent science that allows the design and manufacture of low weight structures for vehicle chassis components. Low weight is beneficial for reduced tailpipe emissions for both existing internal combustion engine vehicles but also as an enabler for further electrification of the fleet. The manufacturing of the optimised structures via the sonication process incurs another challenge: to achieve mass market weight reduction this needs to be done cost effectively. This project builds on top of the deliverables that a current CDT-EI studentship, awarded to Joe Holt (from cohort 1), is generating. The project, funded by the Engineering and Physical Sciences Research Council (EPSRC), is split into two categories. The first will explore ways that technology can improve care for the elderly, while the second will focus on using autonomous (AI) machines to deal with or operate in hazardous environments. Loughborough will receive a £500,000 share of the total funding, which has been allocated to 14 UK universities. The money will towards exploring ‘intelligent manufacturing environments’ – the idea that humans, robots and automated procedures work seamlessly, or ‘co-exist’, to execute challenging manufacturing activities. Through the University’s Centre for Doctoral Training in Embedded Intelligence, the project will be led by Professor Paul Conway, Dr Carmen Torres-Sanchez and Dr Niels Lohse. A new designed training facility has been created to allow scientists to carry out the research. In the area of extreme and challenging (hazardous) environments, robotics and artificial intelligence technologies will allow for the inspection, monitoring, and maintenance of sites that are dangerous for humans to enter. This includes hostile environments such as nuclear power plants, oil and gas sites and off-shore renewables. It also includes hazardous urban and suburban situations involving bridges, roads and railways. The aim will be to develop the science around image and vision computing, verification and validation, smart sensing technology and its associated connectivity with the Internet of Things, autonomous manufacturing, healthcare technology, and intelligent mobility. For more detials visit Loughborough University News. The CDT in Embedded Intelligence was one of the four CDTs invited to this theme day dedicated to showcase the good practice in this area in the UK. Named as one of the Eight Great Technologies in 2012, identified as one of the strengths of the UK, and with the potential to revolutionise the economy and society over the next 20 years, the RAAI community met in London on Jan 31st to share experiences and be evaluated in front of a prestigious international panel which included members from Harvard Uni, UC San Diego, EPFL (Lausanne), Leeds, King's College and UCL, and experienced industrialist (eg Dyson, iTechnic and RU Robots). 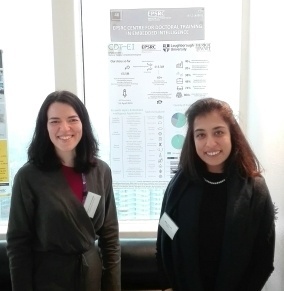 Our Executive Director, Dr Carmen Torres-Sánchez, represented the CDT-EI and explained our strategy in training provision through our 'Transition Zone', breadth of research topics covered, sectors who have partnered with us and quality of the student experience. Thanks to the EPSRC for inviting us. Cohort 2 researcher Melanie Zimmer attended 'using the media to publicise your research' course at Loughborough University. I never thought about using the media as a way of promoting my research. But on the 18th of January, I attended a workshop in the Graduate House just on that. The session was held by two ex-BBC journalists and was aimed at demystifying this particular channel of communication. Although this workshop was tailored to media, the knowledge we gained can also be transferred to other areas - it is always important to understand your audience and to get the right message across. When it comes to understanding your audience, it is also important to understand what your audience judges your interview (or presentation, etc.) on. So be clear on (1) What you say, (2) How you say it (your personality), and (3) How well you understand and address the needs, concerns and prejudices of your audience. Exposing your research through media might be a good way of leading to new funding channels and collaborations. But especially when you consider exposing your research through media for the first time, it might be best to get your University Press Office involved as you can get additional advice from there. Another way of getting your research published to a wider audience could be through https://theconversation.com/uk. The Conversation is a not-for-profit media outlet sourcing content from the research community and providing editorial support. Before an interview, take the time and google your topic under the news section to see what is currently going on in this field. Create a fact sheet with general information on your topic area. If filming is taking place at your office, inform your environment beforehand and keep a clean desk. The workshop also contained a practical training session for us, where we individually got interviewed by one of the journalists for two times 3 minutes – only the first question being made available to us beforehand (As a note: be prepared to be asked questions about costs and when your research will be available!). It felt quite uncomfortable to be put on the spot like this, but it was a great experience to go through such a situation as the sessions were recorded and we received instant feedback by the experts and the other peers. We are delighted to hear Dr Qinggang Meng (Loughborough University) and Motion Robotics Ltd have been awarded over £650,000 by Technology Strategy Board: Newton Fund China-UK research and innovation Bridges Competition for their project titled "YOBAN- a companion robot to assist walking, sitting down and standing up for older people". The project, which includes Shenzhen Institute of Advanced Technology and Shezhen Casun Intelligent Robot Co Ltd, will develop a robot to assist older people from poor, low or middle income with movement, provide companionship and cognitive stimulation. The robot will also provide remote health and activity monitoring for caregivers.